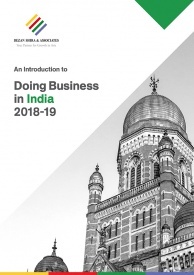 In India, every registered business that is involved in the inter-state movement of goods with a value exceeding Rs 50,000 (US$716) is required to generate an electronic way (e-way) bill. India introduced the electronic bill system under the goods and services tax (GST) in April, 2018 – to ensure greater tax transparency and a hassle-free movement of goods from one state to another. The mechanism ensures that transporters need not have separate transit passes for moving goods across state-borders as the electronic bill is valid throughout India. The state of Karnataka was the first to generate intrastate e-way bills, on April 1, 2018; the states of Andhra Pradesh, Gujarat, Kerala, Telangana, and Uttar Pradesh implemented the system from April 15, 2018, followed by other remaining states in June. E-way bill is mandatory for interstate movement of goods where the value of goods exceeds Rs. 50,000 (US$716), in motorized conveyance. The transportation of goods through a non-motor vehicle is exempted from the e-way bill system. Inter-state transport of handicraft goods by a dealer exempted from GST registration. Inter-state movement of goods to the worker by the principal/registered job worker. A GST registered business can register itself online on the e-way bill system using its GST identification number, also known as GSTIN, and the associated mobile number. An unregistered GST user may also register using their basic information and mobile number. Using these credentials, users can login and start creating e-way bills by entering consignor, consignee and the transporter information. Once an E-way bill is generated, a unique E-way Bill Number (EBN) is allocated to which is available to the supplier, recipient and the transporter. The GST Council has created a user manual for the registration and generation of e-way bills to help traders comply with its requirements. A supplier of goods must procure an e-way bill for all sales, transfers, or exchanges – if eligible. However, if the supplier is an unregistered person under GST, the responsibility of generating the e-way bill lies with the recipient. If the supplier has not generated an e-way bill, the transporter or recipient of the goods has to ensure that the e-way bill is created before undertaking the delivery. For taxpayers registered with the GSTN, the GSTIN may be used to produce the e-way bills. Unregistered transporters are provided a transport ID that replaces the GSTIN on the EWB forms. An e-way bill cannot be amended. If needed, the bill can be cancelled and a new one generated within 24 hours. However, the transport details in Part B can be changed any number of times throughout the validity of the e-way bill. Multiple modes of transport can be included on the same e-way bill. For non-compliance of the e-way bill rules, a penalty of up to Rs 10,000 (US$153.80) or amount of tax evaded, whichever is higher, may be imposed. The transported goods will also be liable for detention or seizure. 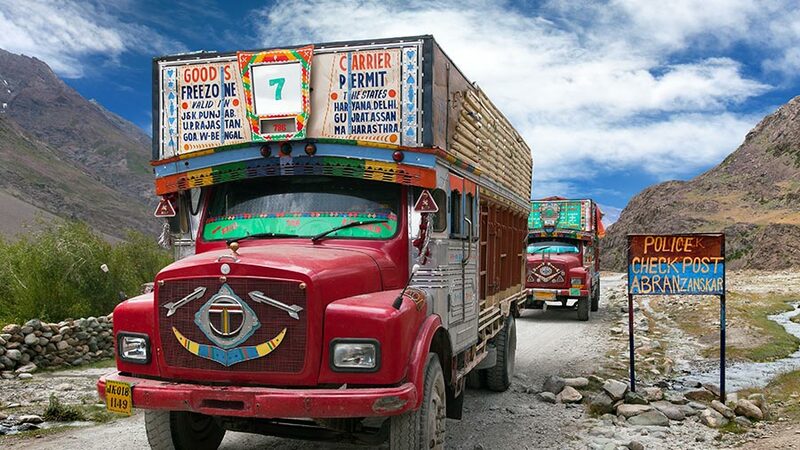 In October 2018, the Indian government made it mandatory for business and transporters to mention PIN codes of places of loading and unloading of consignments. 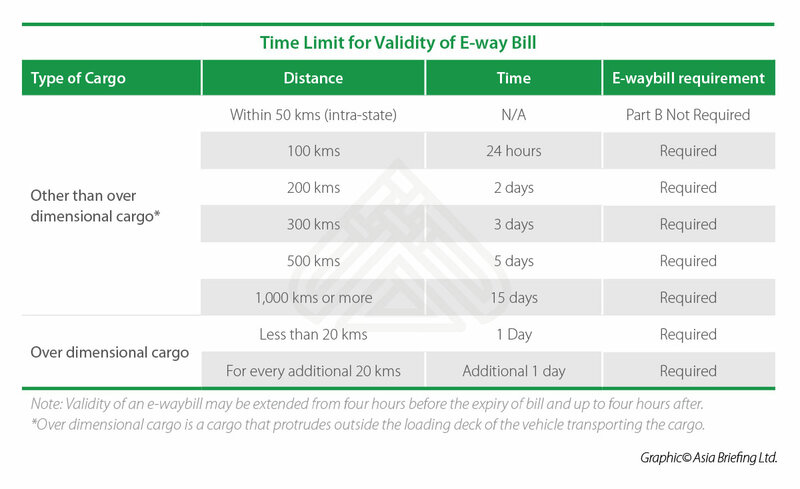 The revised procedures will help in calculating the correct distance and determine the validity of the e-way bill. Following are the forms and documents needed to generate an e-way bill. The GST EWB 01 form details the specification of goods being transported, the consignor, consignee, transporter, as well as vehicle number. The form is divided into two parts – A and B. Part A has to be completed by the supplier and Part B by the transporter. Part B is not required if the goods are being transported for less than 50 kilometers within a state or union territory. In all other cases, if Part B is incomplete, the e-way bill is invalid. Once the transport details are added to the way bill, the transporter has only the prescribed time to execute the transfer (see table below). The transport vehicle must carry a physical copy of this bill or it must be embedded in the conveyance automobile through Radio Frequency Identification (RFID). Form GST EWB 02, also known as the consolidated e-way bill, is a single document that contains the details of all products on a vehicle when the invoices are different for each consignment. In other words, this bill can be generated by a transporter carrying more than one consignment on the same cargo load. All individual e-way bills have to be uploaded onto the portal – a consolidated e-way bill is then auto-generated. GST EWB 02 does not have any specific time validity. This will depend on the GST EWB 01 forms attached to it. This form summarizes the verification of documents and goods in case a transport vehicle is stopped by an officer for inspection. Part A of the form is made available within 24 hours of inspection on the online portal, and a full detailed report in Part B is required to be furnished within three days. If a vehicle has been stopped and physically inspected, it cannot be stopped again within the same state. This mechanism provides security to the transporter as well as the supplier and removes unnecessary delay in the transport of goods. If a vehicle is taken into custody by authorities for longer than 30 minutes, the transporter or the supplier to whom the goods belong can file this report. The e-way bill mechanism is an anti-tax evasion measure by the Indian government. It is put in place to create an accounting trail on a common forum to ensure that goods are transported in accordance with GST laws, and tax is paid for the supply of goods. Every e-way bill generated is automatically updated in the GSTR 1 form of the supplier. For traders, a centralized GST system reduces border control issues between states. E-way bills eliminate the hindrance of physical inspection of papers and goods at each border. Since the introduction of GST, the average distance a truck is able to travel has increased by more than 150 km a day. A survey by the Federation of Indian Chambers of Commerce and Industry (FICCI) on the Ease of Business for Logistics found that 59 percent of companies in India cited reduced transportation times, post-GST, due to the elimination of border check posts, even with the intermittent roll-out of the e-way bill. Consequently, companies are already moving towards a hub and spoke model, where one large warehouse caters to an entire region. As transport options become more structured, companies will benefit from better economies of scale, reduced need for inventory buildup or inventory capital, as well as the ability to implement better management systems. 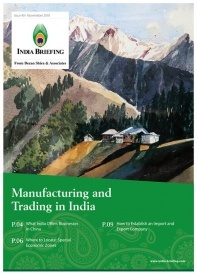 Traders, transporters, and retailers alike will find working within a unified market system in India, a marked improvement over the previous fragmented structure. 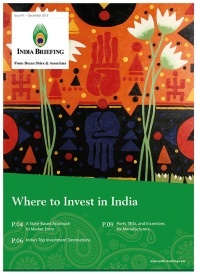 A recent McKinsey report suggested that logistics cost the Indian economy an extra US$45 billion a year. The e-way bill is expected to cut these costs by more than 20 percent. Proper implementation of this mechanism will reduce overall costs and will improve accountability and supply chain systems for traders in India. Editor’s Note: The article was first published on March 30, 2018, and has been updated on December 20, 2018 as per the latest developments.